With a striking pose and a persona soaked rich in southern lore, Hannah Aldridge engulfs the senses of many an Americana romanticist through her wealth of music, influences and tales. 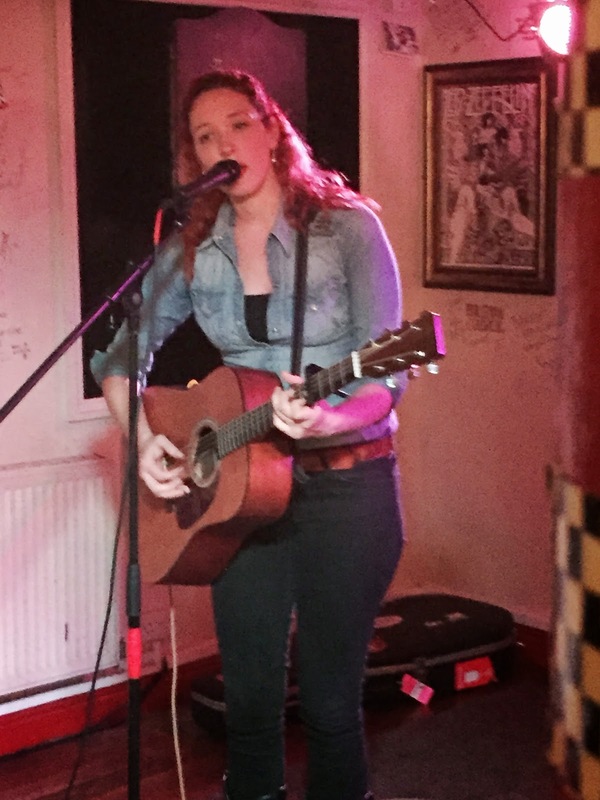 Possessing a voice which perfectly moulds around her songs of sentiment and darkness in equal portions, plus the aura to rise above the bustle of a Friday night venue, works wonders for Hannah’s spotlight presence. The finished article is an enthralling artist finding her true mission to shoot from the soul and keep the fire of pedigree roots music burning. Hannah’s album RAZOR WIRE is just approaching its first anniversary and still sounds as fresh as it did on the first listen. The added good news is that the process for the follow up is well under way with songs beginning to be trialled in live dates and hopefully an early 2016 release in the offing. 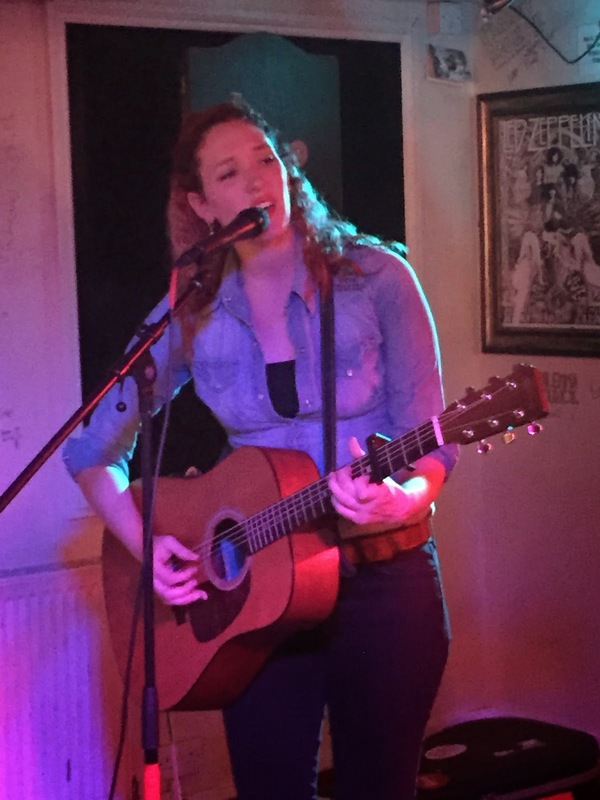 She is also carrying on a mission to initiate greater recognition in Europe and this Bromsgrove gig forms part of a double pronged cross Atlantic assault this year including a return to the Maverick Festival in July. Following the usual formula of a pair of 45 minute sets, Hannah tamed the locals in a Friday night drinking hole even tempting an unusual slow dance to ‘Parchman’, although it was unlikely the participants listened to the words of this tale of death row angst. However Hannah has probably cut her cloth in less salubrious settings working through the music scene in her home state of Alabama. Yet she is now poised for a breakthrough and it would advantageous if she continues to court the same acclaim that was forthcoming during previous visits. Although Hannah raised a lot of eyebrows with her stunning set at Maverick last year, it was much more rewarding to observe this extended show allowing her to develop the song introductions, experiment with new material and pay tribute to her influences with some well-chosen covers. The latter saw Hannah celebrate the music of fellow Alabama resident Jason Isbell with a superb version of ‘Cover Me Up’ and give respect to a hero by playing Jackson Browne’s ‘These Days’, an artist she named her son after. Moving onto family matters and Hannah doesn’t hide the fact that her father is a highly esteemed songwriter who ventured out of their hometown Muscle Shoals to pen a string of country music hits. She acknowledged the work of Walt Aldridge by delivering a version of ‘Modern Day Bonnie and Clyde’, a big hit for Travis Tritt. This song was actually a co-write with James LeBlanc and Hannah keeps the family tradition going by working with his son Dylan. Another song from this writing team that she delivered beautifully during the show was a Civil War tale called ‘Yankee Bank’, certainly written from a southern perspective. More importantly, Hannah displays an immense flair for writing herself whether commissioned or with the intent of recording. A special highlight this evening was getting a preview of three songs potentially earmarked for the next album. The most striking was ‘Birmingham’ which was introduced with an acknowledgement that it was being aired barely 10 miles from the UK version. While still very much work in progress, it possesses a strong structure and melody to make a substantial impact. The other new songs Hannah introduced were ‘Lace’, written on the horror subject of possession and a favourite genre of her commissioned writing, and ‘Gold Rush’, reflective thoughts on the race for recognition in the early stages of a music career. The material from RAZOR WIRE was obviously familiar to those attending specifically to see Hannah rather than have a drink and a chat, with from a personal point of view ‘Black and White’ being the highlight. Each song played from this record had a suitable explanatory introduction with ‘Old Ghost’, ‘You Ain’t Worth The Fight’ and ‘Howling Bones’ still retaining that special appeal garnered from multiple listens making the album one of the most respected releases of 2014 in these quarters. From a genre perspective overseas, Hannah Aldridge is a quintessential Americana performer heavily influenced by country, rock and soul – who wouldn’t be coming from Muscle Shoals. She is proud of her roots and is fighting a fair game to make a name in both the crowded market back home and the fluctuating ones in the UK and on the continent. Hannah Aldridge deserves to succeed and the pleasure is totally in the experiences of those joining her on this journey of discovery, optimism and hopefully fulfilment.